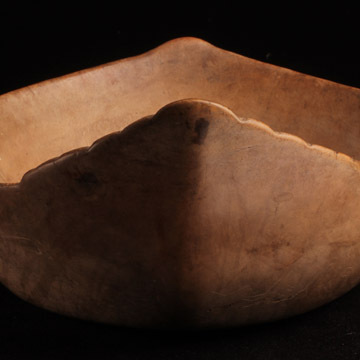 In the canon of Eastern Woodlands bowls, this striking example stands high in terms of sheer elegance and quiet beauty. We find it truly sublime. The highly castellated back with repeating scallops recedes from the bowl as it rises, which is quite unusual. 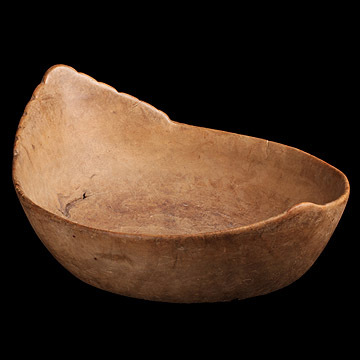 The elongated form and opposing crest indicate that the origin of this bowl is likely Northeastern-central New York or even Southern Ontario—which would make this bowl of Iroquois or Ojibwa manufacture. Though the nature of the carving is not fully understood, the castellation is interpreted as being avian in nature—however, it is possible that the bumps may refer to the backside of the Underwater Panther (see Powers, Good Wood, Vol. I, The Evolution of the Water Manitou as Seen Through Its Presence in Woodlands Bowls & Ladles, 2008).